The thin, flat design of the H101F stage maximises obstruction free space enabling easy convenient sample loading / unloading and unimpeded 360 degrees rotation of microscope nosepiece and objectives without risk of damage to the microscope, stage, inserts or the sample itself. Ultra low profile sample holders facilitate the use of high NA objectives / condensers while the latest in miniature high torque motors facilitate access to the condenser and other microscope adjustments. 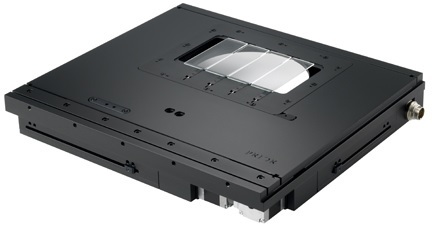 Precision movement is guaranteed over the full 114mm x 75m travel on a H101F flat top stage. The mean uni-directional repeatability is 0.2 µm with a maximum speed of approximately 100 mm/s. Optional embedded high resolution XY encoders enable ultra high precision (0.01 µm) positioning. Adding versatility to precision, the H101F weighs just 4 kg, but is able to take loads of up to 10 kg. The large sample holder design area on H101F flat top stages accommodates a variety of applications such as large tissue sections and other custom sample holders. The H101F features smaller gauge stage cables which simplify cable routing. Older sample holders are also compatible with the H101F by adding a simple adapter plate. Patented Intelligent Scanning Technology (IST) comes as standard on the H101F further increasing the accuracy of the stage’s movement. The H101F stage is controlled by the Prior Scientific ProScan® III system which is easily integrated into most imaging software packages, allowing the H101F to become fully integrated into your overall imaging process. NeuMoDx plans to deliver 11 CE-IVD assays to QIAGEN by the end of 2019 on NeuMoDx System as part of aggressive menu expansion plans, including blood-borne viruses, women’s health and transplantation assays.